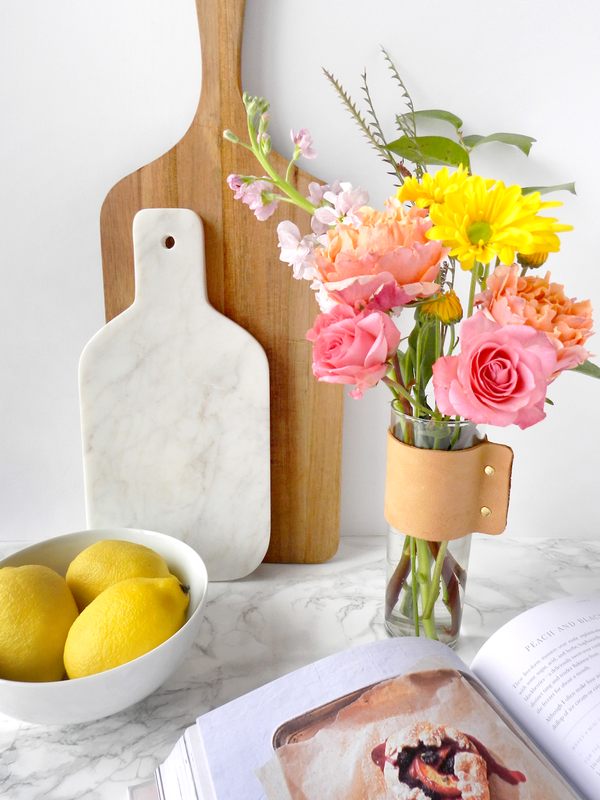 Fresh flowers are one of my favorite ways to brighten any space, which probably explains why I have such an extensive collection of vases! 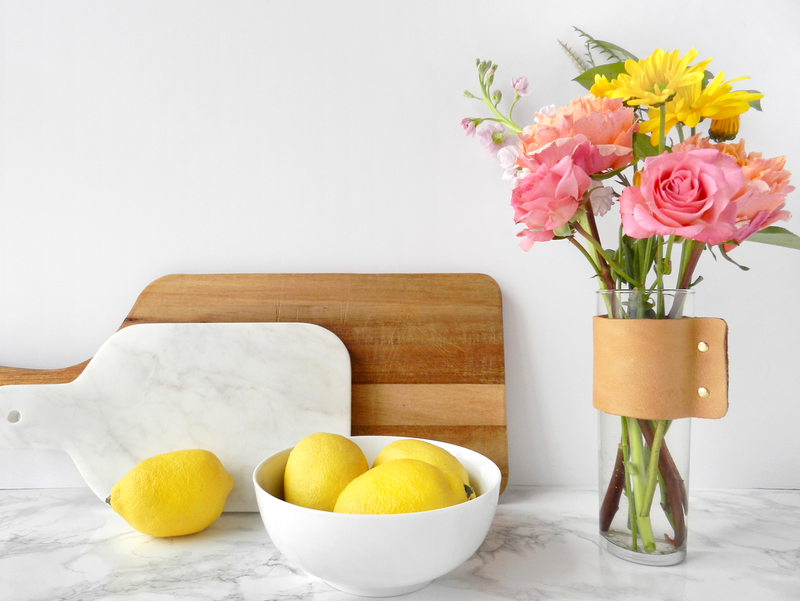 Whether adding a few fresh blooms to your desk at work, or splurging on a bouquet for a special occasion, it's always a good idea to have a vase on hand to put together a last minute arrangement. 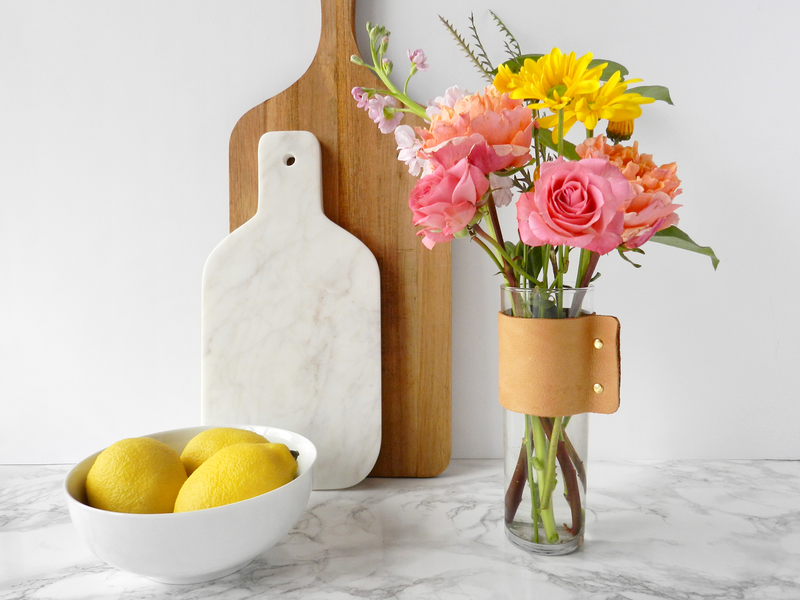 Now that Spring is officially here, I couldn't help but share this simple DIY for a leather wrapped vase. This is the type of project that requires minimal effort, but looks like something you bought, rather than made. I also love that you could use materials you already have on-hand to transform a generic vase into something worthy of a centerpiece. 1. Begin by measuring the leather to the length and width that best fits your vase. Mine measured approximately 2.5" in width and 9.25" in length, but depending on the vase you're using, another size might work better. Your leather strip should be approximately 1" longer than the circumference of the vase to allow for a 1/2" area where the rivets will be secured. 2. Using a ruler, measure 1/2" from the edge and mark where you want the rivets placed. Use the rotary cutter to punch holes in the leather, following your marks as a guide. Repeat the process on the opposite end of the leather, ensuring that the holes line up. 4. Once the rivets are secured you will have a leather "sleeve" that can be carefully slid around the vase. Ideally the leather sleeve should be big enough to fit around the mouth of the vase, but still be snug enough to stay in place without slipping.